Old Dogs and New Tricks! This year, three of us in the EBSD development group (Stuart Wright, Scott Lindeman, and myself) celebrated 20 years at EDAX. I consider myself quite fortunate to have gotten involved with EBSD so early in its commercial development, and it’s been exciting and rewarding to see its growth, both in terms of number of users but also in the wide array of applications. However, there are still some characterization challenges that we continue to revisit. One example is differentiating ferrite from martensite in different steel alloys. This phase differentiation application is challenging because martensite is crystallographically only slightly distorted from the ferrite body-centered cubic cell, and that distortion will depend on carbon content and thermal processing history. This makes it difficult to differentiate these phases directly via crystallographic structure measurements. Because the martensitic phase is generally more strained, most differentiation work has focused on using the EBSD Image Quality value as the key differentiation metric [1-2]. As new features are developed, it is enjoyable to see where these features can be applied, and what benefits might be gained from them beyond what was initially envisioned. One example is Neighbor Pattern Averaging and Reindexing or NPAR. NPAR improves the signal to noise of an EBSD pattern by averaging each pattern with all the neighboring patterns, as shown in Figure 1. NPAR was initially created as a method of successfully indexing some very noisy patterns we received from a customer, but we quickly found benefits trying this approach on a range of different materials and under different SEM operating conditions. More details can be found in an earlier blog post at : https://edaxblog.com/2015/09/. 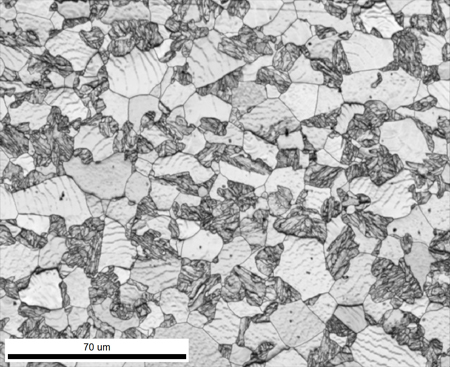 Figure 2 shows EBSD Image Quality (IQ) maps collected on a dual phase ferritic-martensitic steel sample. Fig 2a shows the IQ map collected under standard conditions, while Fig 2b shows the IQ map after NPAR processing. It can easily be seen that the phase contrast has been increased after using NPAR. This is because the quality of the EBSD pattern from the martensitic phase is lower due to the internal strain and not because of camera parameters. This means that the spatial pattern averaging of NPAR does not improve the IQ values for the martensitic phase at the same rate as it does for the ferritic phase, hence increasing the phase contrast values. NPAR processing does have another effect that can be observed. 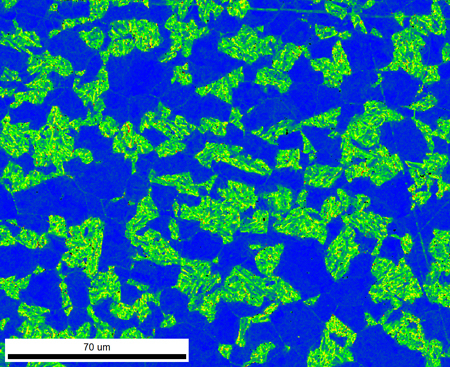 Using NPAR, orientation precision is improved through better Signal to Noise levels in the EBSD pattern, resulting in more precise band detection. Because of this effect, the average misorientation (as measured here with the Kernel Average Misorientation metric) measured within each martensitic grain is lower with NPAR processing. The results with and without NPAR processing are shown in Figure 3. While NPAR does improve indexing and orientation precision performance, this improvement reduces the effectiveness of the KAM value to differentiate these phases. I think the fact that NPAR improves one indirect differentiation method while not improving another shows why this is a challenging characterization problem. In the end, while NPAR does offer some improvements, we still have not found a fully satisfactory solution to the ferrite-martensite differentiation problem. I look forward to continuing to work on this and other characterization problems as we continue with EBSD product development. Wilson, A. W., J. D. Madison and G. Spanos (2001). “Determining phase volume fraction in steels by electron backscattered diffraction.” Scripta Materialia 45(12): 1335-1340. Nowell, M. M., S. I. Wright and J. O. Carpenter (2009). A Practical investigation into Identifying and Differentiating Phases in Steel Using Electron Backscatter Diffraction. Materials Processing and Texture. A. D. Rollett. Hoboken, NJ, John Wiley & Sons: 285-292. To learn more about NPAR click here to see our video overview. ← It’s All About Speed!